Amusingly enough, I’m looking at spending the rest of the year in London, too, but when I asked this question on my G+ the only answer I got was one vote for AD&D DMG. I still haven’t fleshed out my own answer. I’m still thinking about this. 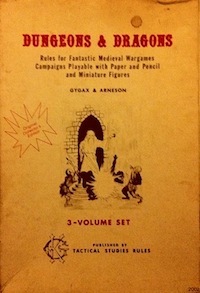 The DMG, of course, but maybe the other two AD&D books, too (plus FF). I expect that the Traveller5 book will be in there (if not, Traveller will take up three slots, as I’d have to include the 3 MT books). The core Pendragon book, and maybe Pagan Shore. Flashing Blades. Any more would depend on the specifics of the first couple of games. It might be the DMG and the Rules Cyclopedia instead of all four AD&D books (I go back and forth). I might not end up liking T5. I might find something more important than Pagan Shore (though I doubt it). Still a lot to think about. Do you prefer MegaTraveller over Classic? Except for the setting changes, yes, for the most part – but I’m not really interested in the Imperium setting these days, anyway. Besides, if I wanted CT, I’ve got The Traveller Book. So, I have T5 in my possession, and I find that it is not what I’d hoped. It’s good, don’t get me wrong, but it is not up to MT’s standards, which is still my standard for best Traveller edition. On the other hand, it is very, very complete, which is a significant advantage in these sorts of exercises. So, 3 MT books, the DMG, Pendragon (4th edition) and Pagan Shore, Flashing Blades, ACKS, the Adventures Dark & Deep Players Manual, and the Monster Manual. I might dump ACKS for the ADD referees book, but I don’t have it yet. I will almost certainly dump the Monster Manual for the ADD monster book when it comes out. That’s three iterations of B/X you have there. 🙂 A good list though, and one that I would greatly enjoy gaming with. I’m surprised you did not include any Call of Cthulhu (or similar games) given the focus of Dreams in the Lich House. Starstone is new to me. There is a review in Dragon #97 which makes it look quite interesting. Paul Vernon wrote some articles for White Dwarf, which are quite brilliant, and an adventure ‘Trouble at Embertrees’ (WD34?) which gives a very good idea of his style. I paid about $100 for my copy. I guess I have converted to the digital age as all my physical RPG material sits in boxes in the garage and I rarely ever go open them up. Game mechanics wise, I speak a hybrid Basic and Advanced D&D. I no longer need a reference book for the rules. Therefore, I think my choices would actually veer toward the GURPS sourcebooks; Vikings, Rome, Celtic Myth, Camelot, Cyberpunk, Japan, Old West, Time Travel, Atlantis, Swashbucklers. Growing up in the late 80s, early 90s, it was like having wikipedia at your fingertips before you had continuous access to the Internet. As much as I love many of my role-playing books, I have all ten Unknown Armies books. The last one isn’t so much a roleplaying book as a book I refer to a lot when running games. If I had to swap it out for anything, it would be a printed copy of Kellri’s Encounters Reference. Oh! Mythic GME is one I completely forgot. Hm. Moldvay Basic and nine books of 70s album cover art. Hmm, maybe I should add Unknown Armies to my list of things to check out at some point. What makes it special? It’s one of the few books since the DMG to have useful advice for GMs, by laying out how relationship maps work and how to pace sessions. The system itself is a nice, rules-light, non-Cthulhu-based occult horror / urban fantasy system with some interesting play quirks (PCs never know how much HP they have left; the baseline for skills is calculated from the percentage to successfully perform the skill while fleeing down a dark corridor being chased by ravening monsters; madness meters and triggers make the player struggle for control of their character). *I really prefer Jorune 2e but that’s three rulebooks and a module in a box, whereas 3e is one book so it wins on this occasion. Your accursed ten-book limit is hard on boxed sets. I ordered a copy of that 2E Vikings book late last year and have not got around to reading it yet. If it’s all the way up on your top ten, I better bump it up in the queue. 2e gets a bad rap but I thought the historical sourcebooks were generally very well done and encouraged DMs to tweak classes, magic, and other rules to suit different kinds of campaigns. I think David Cook’s Vikings sourcebook is as good as the equivalent ones for RQ or the recent BRP Mythic Iceland book. I’ll be hacking its rune magic system for my next D&D campaign. Good stuff. Why would you choose 1st edition Gamma World over Mutant Future? Just curious. I’ve thought about getting a copy, but have avoided it so far. Late Gygax tends to be a bit prolix for me.